SPS 1230 & SPS 1540 Label shrink tunnel adopts hot air circulation for shrinking, is mainly used for shrinking labels of bottles, jars and cups etc, no matter the label is on the body, bottom or cap of the bottle. Adopt high power blowing motor and turbine for air blowing, which will not cause label to change position or become deformed. 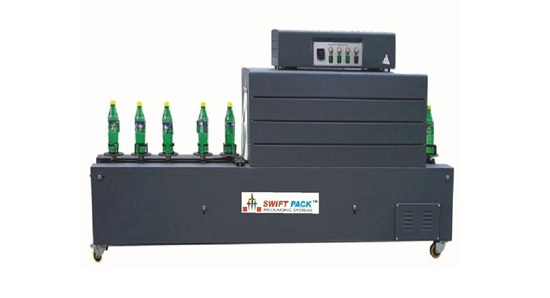 Simple changeover for different kinds of bottles. The heater made of stainless steel has long use life. The shrink temperature can be regulated according to the requirements of package at will, up to 300℃. Adopt stepless conveying speed regulation controlled by electronic speed governor. Only the cap parts of bottle is heated, so the quality of product inside the bottle will not be affected due to high temperature. Tunnel can be heated partially according to some special requirement of the products in order to save the energy. The machine can be operated alone or connected with production line. Inside the tunnel, two high power blowing motors to ensure enough circulating air. If necessary, rotary device can be added and the blowing air for the tunnel can be strengthened partially. It is equipped with the ground bolts and truckles, so the machine can be moved and fixed freely. Label shrink tunnel is widely used in industries such as foodstuff, beverage, pharmacy, cosmetics and pesticide for containers with labels like glass bottle, plastic bottle, paper cup etc.